Innovators for Environmentally Safer Chemical Containment - Peabody Engineering & Supply, Inc.
Peabody Engineering & Supply, Inc. are Innovators for Environmentally Safer Chemical Containment. And we want to tell you and show you all about it. 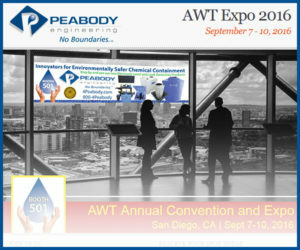 That’s why when you attend the AWT Expo 2016, Sept 7 – 10, in San Diego, CA, you are going to make a point to stop by Booth #501 and gives us the opportunity to share with you how our Peabody Products can help in your workplace to keep a safer environment. Click below to register for the show and we are looking forward in meeting up with you!